UCMC publishes a translated short version of the article by Andriy Synyavsky for Tsensor.net. The official count of the war in Ukraine starts from April 12, 2014 – the day when Russian law enforcement personnel seized police and security service offices in Slovyansk, Kramatorsk and Druzhkivka, Donetsk region. Yet there is a group of people for whom the war had started three months earlier. Ukrainian ultras made their way from participating in the Maidan events to the war in eastern Ukraine. 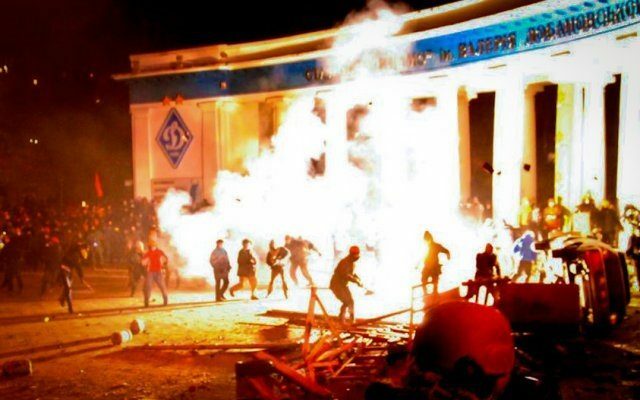 To many Ukrainian ultras, the war started from the standoff with law enforcement close to the “Dynamo” stadium named after Valerii Lobanovskyi in Kyiv in January 2014. The peaceful protest in Maidan grew into violent clashes on Hrushevsky street. “Berkut” riot police standing against the football fans were Ukrainian only formally, while they were actually acting against the Ukraine’s state interest. Hostility between the ultras supporting different football clubs was put aside in 2014 when they united against the common enemy. Persons that were earlier seen with caution by the citizens indifferent to football, have now become their defenders. For ultras, the war started on January 19, 2014, and is still on. Today it is quite unlikely to hear that fights and intimidation of passers-by is all that the football fans are capable of. Back in 2014 the fans of Dynamo Kyiv, Skakhtar Donetsk, Dnipro and Metalist Kharkiv football clubs united efforts against the aggressor leaving behind all football-related disputes. Ultras of the Kharkiv-based club were among the first to have signaled the changes and performed the famous “Putin” chant. [The slogan in question is “Putin khuilo!” – (Putin is a dickhead), it originated in 2014 and grew from a football chant first performed by FC Metalist Kharkiv ultras in March 2014 into a popular song far beyond the football context – UCMC]. Many ultras were among the first to go to the combat zone to protect Ukraine against the Russian aggression and Russia’s collaborators in Donbas. They mainly enlisted in Azov, Aidar, Dnipro-1 and Donbas volunteer battalions as well as in the OUN battalion, 1st and 2nd operational reserve battalions of Ukraine’s National Guard (later reorganized and renamed into Serhii Kulchytskyi battalion) and Pravyi Sector volunteer corps. “Wider society sees the war as an event of secondary meaning, often forgetting what it means to be united to protect your country,” Andrii Syniavskyi says in the article. “Somewhere in the east the well-equipped army is holding the defense. One gets an illusion of the calm situation; political issues that are only dividing the people seem to be more important than the state’s survival in the war time,” the author continues. “In this situation, many of us need to learn from the football ‘hooligans’. They seem to have understood it better than the others that these are not peaceful times. And whatever the problems of this state are with its reforms and political elites, it needs to be protected as it is,” Syniavskyi says. “Being an example for the others, changing the country – that’s what ultras have succeeded to do and what others need to learn from them instead of being hysterical on social media,” the author concludes.